I finally got a chance to do some art Friday night when we arrived at my moms. I was so enamoured with my pastels I managed to get two of the John Street Animal Hospital fundraiser pet portraits done. Two down – nine to go! 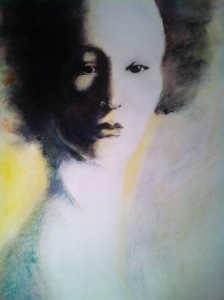 I continued with my pastel portrait binge using a high contrast photo as a starting point. I am so happy with the results! I am going to continue with these for my upcoming Art Show – Hints of Yellow – December 7-8 at the Mill Pond Gallery, 314 Mill St, in Richmond Hill, Ontario. I am partnering with an abstract artist Renee Zie. Our contrasting subjects and styles will make a very dynamic show. I hope to see you at the show.